BAFTA Independent Production Company of the Year – Belfast-based studio Sixteen South – has announced today that RTÉ is the lead broadcaster for its new live action children’s sitcom, WildWoods. The show, targeted at kids aged 4 to 7, has just begun filming and will premiere in the autumn. WildWoods, which is currently in production in Northern Ireland, is funded by Northern Ireland Screen via Invest NI. 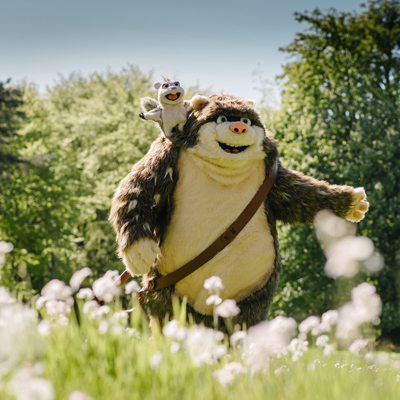 WildWoods is a live action comedy series which is being filmed in beautiful forest locations and aims to encourage children to take a digital break and rediscover the great outdoors. The 26×11’ puppet series is based around the adventures of an odd couple: city-boy Cooper, a 7ft Sasquatch, and nature-loving Poppy, a pint-sized Sugar-glider. In each of the episodes, a simple task usually goes very wrong as Cooper’s sheltered indoor existence makes him ill-prepared for outdoor living. Shot in the great outdoors all across Northern Ireland as well as the Republic of Ireland, the real outdoor locations provide a cinematic backdrop that reinforces the series’ key messages of appreciating the wonder of nature. Sixteen South is working closely with Tourism Ireland to identify the most incredible filming locations all across the island – clifftops, valleys, mountains and deep forests for Cooper and Poppy to visit and really show off the very best of Ireland. WildWoods will also be heading down under to Australia as the series has been sold to national broadcaster ABC Kids. WDR is handling worldwide distribution.